Two weeks ago we spent some time on Mull, staying in Tobermory. 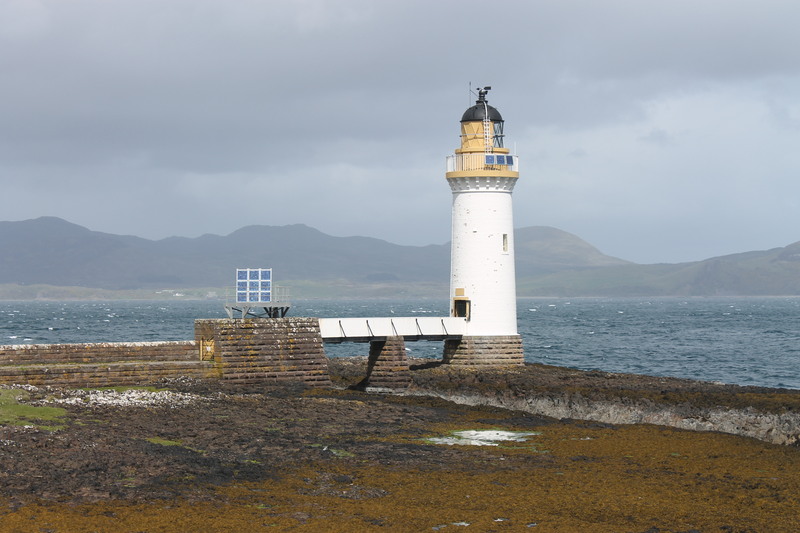 As soon as we left Oban on the ferry the lighthouse viewings began, with a glimpse of Dunollie beacon, just north of Oban, and the stunning Lismore lighthouse (more on that one in the next post). On our first full day we decided to risk getting a soaking by walking to Rubha nan Gall lighthouse to the north of Tobermory. Shortly after leaving the road and heading through the trees, we came across a sign telling us that the path ahead was closed. It was clear that no one had really taken much notice of the sign, so we pretended we hadn’t seen it and continued along the coastal route, which proved to be particularly muddy and narrow in places. It was quite a picturesque walk and we were fortunate not to be rained on. As we approached the lighthouse I remarked on how similar it looked to Eilean Ban lighthouse where we had stayed just a few weeks before. It’s not only the lighthouse that’s similar, but the access bridge as well. Unfortunately a high locked gate prevented us from reaching the tower, but we got some great views anyway from the pier leading to it. We spent a while sitting on the pier and enjoyed the emerging sun while we could, with views across to the Ardnamurchan peninsula. The walk back was equally enjoyable. When we returned to Tobermory we stopped off at the town’s museum, where we found out about the story of Neptune II that set off on a 100 mile overnight journey from one port to another in Newfoundland in 1929. The ship was caught in a storm which caused them to endure a 48 day, 3,000 mile journey, during which they came across the lighthouses at Skerryvore, Dubh Artach and Ardnamurchan before setting foot on land again. 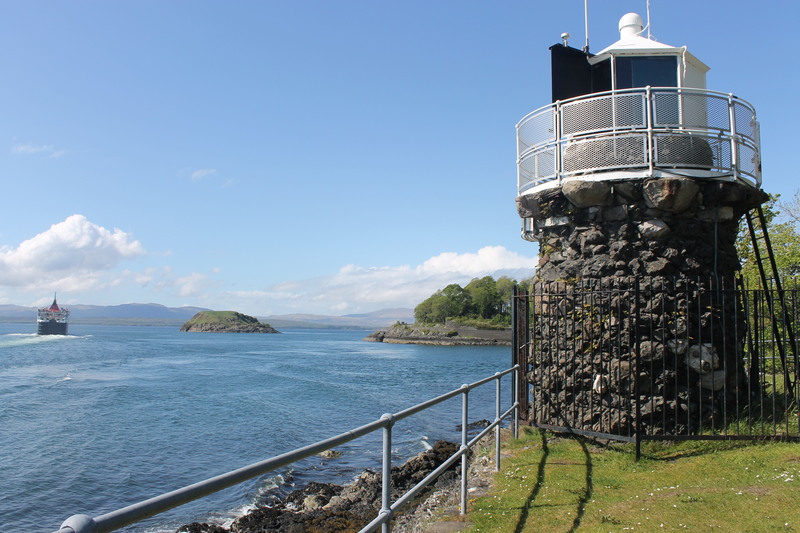 We also found a little more information about the Rubha nan Gall lighthouse at the aquarium in Tobermory. We spent an afternoon walking across to Erraid, a tidal island, and exploring the island. Erraid was used as a base for construction of the Dubh Artach lighthouse, including the quarrying of the granite for the tower. 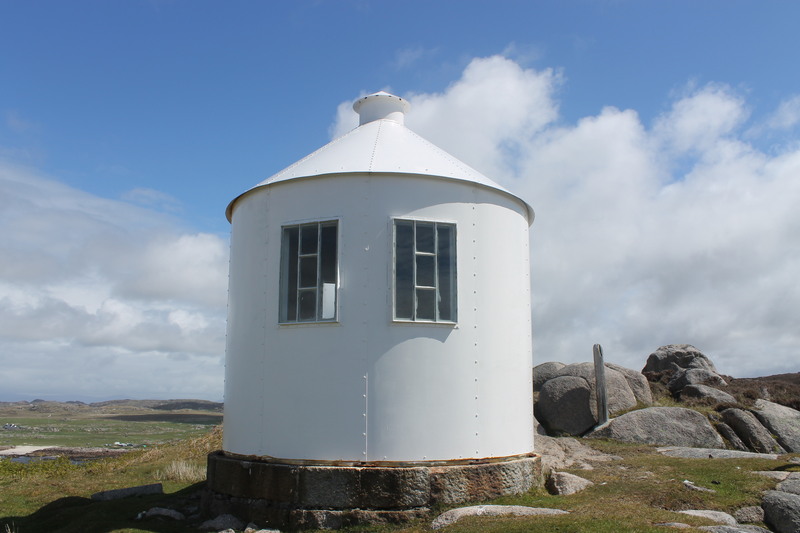 While the lighthouse was in operation, the keepers and their families lived on Erraid and the observation tower was also constructed. We visited the tower and were able to get a distance glance of Dubh Artach lighthouse (more on this one too in another post coming soon). Robert Louis Stevenson visited the island while his father was involved in constructing the lighthouse and set his novella ‘The Merry Men’ there as well as a chapter in ‘Kidnapped’. It’s a fantastic little island and even more enjoyable with the knowledge that you need to get back before the tide turns! Our final day on Mull was spent visiting Iona. On our return journey to Oban we noticed the Northern Lighthouse Board’s maintenance vessel, Pharos (which we had previously seen at Bell Rock and on our way out to St Kilda), parked up a short distance from the Oban ferry terminal. We took a drive up and noticed that the Northern Lighthouse Board have a terminal there, which is a base for their vessels, but also where passengers for the Hebridean Princess alight. On our way north to Appin, our base for the following week, we stopped to look at the Dunollie beacon a bit closer up.